Colorado, and specifically Summit County has one of the top wedding venue scenes in all of the U.S.A. Beautiful scenery, 300 days of sunshine, and stunning views, are just a few reasons why Colorado is so special. 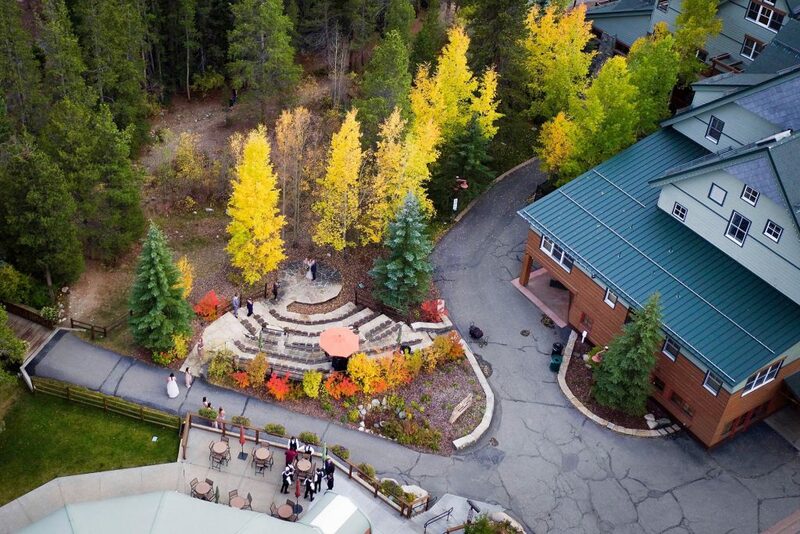 Warren Station at Keystone continues to be one of the top Colorado Wedding Venues in the state year in and year out. If you are interested in visiting Warren Station Book a Site Tour and discover all that we have to offer. Warren Station, located in the heart of Keystone Resort gives couples the opportunity to have a gorgeous mountain wedding for a reasonable price. Couples can tie the knot in beautiful Quaking Aspen Amphitheatre before headed into Warren Station for their cocktail hour and reception. The lobby provides a wonderful indoor/outdoor cocktail hour space. This allows couples to display guest books, gift tables, and appetizers for their guests. The main hall is fully customizable so that couples can create a specific floor plan for their needs. As a result, every wedding is unique. Clients may also add additional amenities including up-lighting, a projector/drop down screen, and a stage for live music/DJ. Warren Station does not require any one catering service to be used. This allows clients can set the budget and menu themselves through the caterer of their choosing. As a result, couples have leeway to work within their budget. Another benefit Warren Station provides is our preferred vendor list. Couples may use this as a reference, but may book any licensed caterer they would like. Some of the staff favorites include Black Diamond Gourmet, All Love Catering, Gilchrist Catering, and Food Hedz World Café. Check out a complete list of vendors (Caterers, DJ’s, Florists, Musicians, Photographers, and more) here! Located in River Run Village, Warren Station is surrounded by restaurants, lodging, and recreation. This is a huge advantage to guests of your wedding. There are many restaurants within walking distance of the venue. Restaurant options include Montezuma Roadhouse, 9280 Tap House, Pizza on the Run, Kickapoo Tavern, Luigi’s Pasta House, Inxpot, and the Spoon Café. Take advantage of great lodging opportunities at Keystone Resort, Summitcove.com, or Vacasa.com. All provide excellent lodging that is close to the venue. Book a tour today and discover why Warren Station continues to be one of the top Colorado Wedding Venues every year.